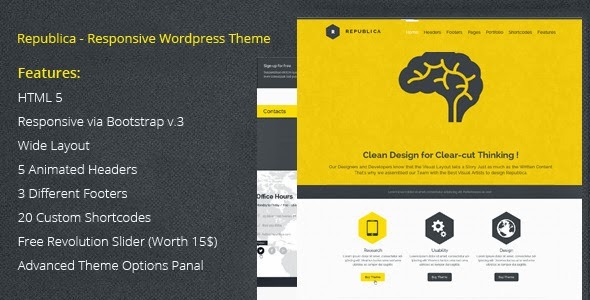 Republica WordPress Theme gives you the opportunity to show your visitors who you are and what you are doing in a fresh and stylish way. Republica has an advanced Theme options panel that gives its users a lot of freedom to customize the theme. You can set a custom logo, favicon, background color or image, control layout, and much more! Item Reviewed: New Responsive Corporate WordPress Theme 9 out of 10 based on 10 ratings. 9 user reviews.